Have you ever considered working for yourself? 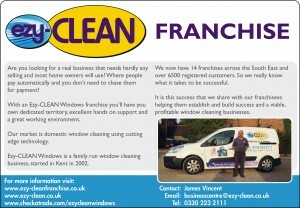 An EZY-CLEAN franchise will give you an excellent regular income and peace of mind. It also means that you have a stable business for the rest of your life. Domestic window cleaning is a major growth market in the UK, and the continued building of thousands of new houses throughout Britain represents a first class opportunity to own a modern and profitable business. We have developed a unique cleaning and administrative system that means that all you have to do is clean windows! We have removed the usual problems of scheduling and payment by inventing an automated system that maintains and monitors all aspects of your business. It enables you to leave us to do the paperwork whilst you can earn more money! How much is up to you, but many window cleaners lose a third of their time to administration. When you start a franchise with us you become part of a wider group of franchisees that are all working towards the same goal. We call this the franchise family. You can see our other franchisees and their unique web page by visiting our areas page. Just click on a coloured shaded area and then the link in the pop up box and you can meet the franchisee operating in that area. Our unique Freedom Reach and Wash System means you can have either a van-based or home-based filtration system dependant on your situation. Our unparalleled knowledge of the domestic window cleaning industry means that you don’t need any previous experience in either using the Reach and Wash system or knowledge of the industry. Our excellent training will have you cleaning like a professional and making a return on your investment in no time! Have a look at our video below to see more on a day in the life of a franchisee. 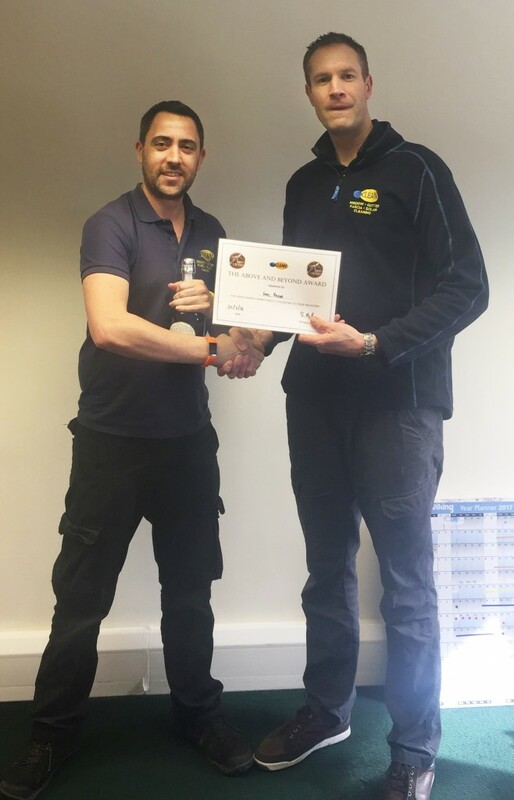 In March 2017 we were proud to present Tonbridge franchise owner Karl Pryor with the “Above & Beyond Award”. The award is in recognition of an exceptional 6 month period of franchise performance. Franchisees can self-nominate or be nominated by others and amongst other things win a £100 John Lewis voucher. Karl has been part of the Ezy-Clean franchise family for 8 years now and last year signed for another 7 year term. Karl is one of 14 franchisees in the Ezy-Clean family and we are constantly growing and looking to expand our franchise group.